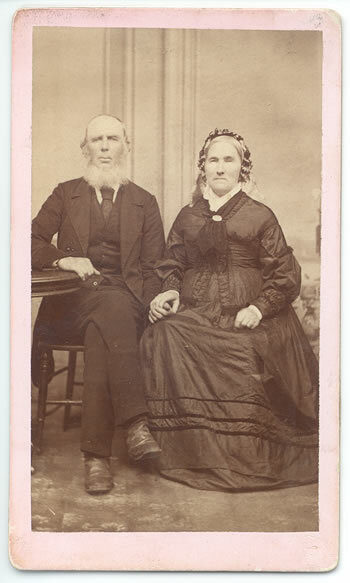 This is Samuel Tupper (1808-1891) and his wife Martha (Howard) Tupper (1808-aft 1891). Samuel and Martha were from Stewiacke, Colchester County, Nova Scotia, but they lived on McNab's Island for a while and this picture may have been taken then. In their later years they lived with their son Robert G. Tupper and his wife Elizabeth. A caption on the back reads "Mr and Mrs Samuel Tupper, Grandpa's parents," in the handwriting of my Grandmother, Alyce Weir. Her maternal grandfather was Robert G. Tupper, son of Samuel Tupper and Martha Howard. The photographer's information is: James Ross, Photographer, 197 Hollis Street, Opposite Provincial Building, Halifax, N.S.